Nelda Villarreal and Maricela Lozano get emotional at an event Wednesday commemorating the 50th anniversary of the Edcouch-Elsa High School walkout, at the high school auditorium in Elsa. Maricela Lozano was 14 years old at the time of the walkout. 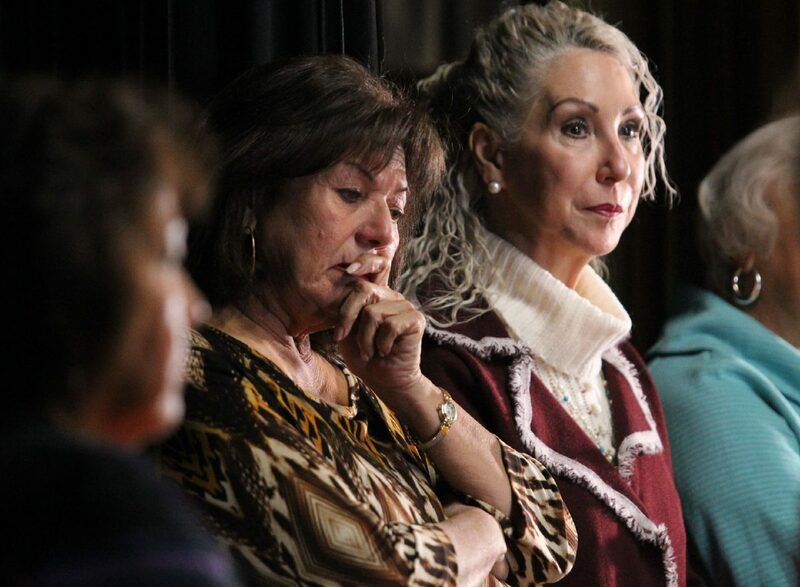 EDCOUCH — One by one, some of the former students who took a stand against racist policies and inequality by walking out of the old Edcouch-Elsa High School in 1968 took the stage of that same auditorium Wednesday morning, exactly 50 years later. The school district along with the University of Texas Rio Grande Valley and the media outlet Neta, held a remembrance of the 1968 Edcouch-Elsa student walkout at the same campus where it all happened. The event began with a presentation at the auditorium of past and current generations of Edcouch-Elsa high school students, who relived the demands that became the basis of the rights Mexican-American students enjoy today. At the time, students were penalized and even expelled for speaking Spanish on campus; there were no counseling services and scholarships available to them; membership to school clubs was not permitted to them; and there were few free services despite most students coming from humble backgrounds. Amid tears and emotional recollections, all of those who took the stage Wednesday to share their memories of the walkout pleaded students to take advantage of the opportunities now available to them, to pursue an education and never be ashamed of their culture and roots. A list of 15 requests drafted by the students 50 years ago and read aloud by current students Wednesday included: zero penalization for those that participated in the walkouts, reasonable prices and better quality foods at the cafeteria, access to college advising and not only technical careers, Mexican-American and Mexican history courses, justice and banning violence against these students. This initial commemoration was followed by a brief walk between the old high school and the new school district performing arts center, where they were met by about 500 high school juniors and seniors to continue the conversation. “Students, those of you that are here at Edcouch-Elsa High School, hopefully before we leave today, you’ll not only have a better understanding but better appreciation for a lot of the efforts and a lot of the sacrifices that these individuals made to try to provide you with the best education,” Superintendent Ronaldo Cavazos said to his students. Francisco Guajardo — executive director of UTRGV’s B3 Institute, which promotes bicultural, bilingual and biliterate teaching in the Rio Grande Valley — thanked walkout participants for taking a stance for future generations. And in the spirit of what they fought for, he fluently switched from English to Spanish.